‘ME & HIM: A Guide to Recovery reveals new insights into my recovery from parent-teacher harassment and mental illness. In my self-help memoir, I share practical mental wellness advice: de-mystifies meditation, addresses sleep problems and explains how to beat depression and anxiety. I’m in ecstatic raptures over my new book cover … Just take a look! 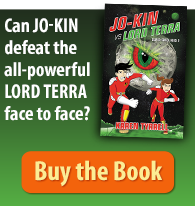 A Special thanks to Wendy Johnson, editor of South City Bulletin for recommending my book as a Beta reader and as a reviewer. 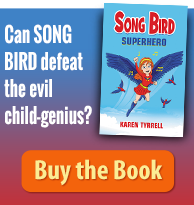 Wendy’s powerful blurb adorns the top of my front cover! for designing my striking cover, promising to grab the Readers attention, interest and imagination. I love Anthony’s original graphics, colours and design … Hope you do too. I’m ecstatic to share my new cover with you my friends, and to the world. Only #8 weeks to go to my book launch on the 5th of March! What’s your first impression of ME & HIM’s unique cover? … Does it draw the eye? Reviews from mental health organizations, advocates, journalists and authors are coming in. Can’t wait to share them with you soon! 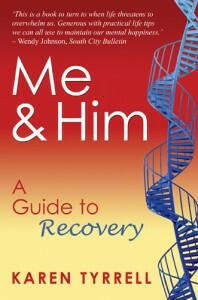 Does the book cover entice you to read ME & HIM: a Guide to Recovery? 13 comments to ME & HIM: Houston: We have a Book Cover! Looks great, Karen. I like to see covers relating to one another in series. I’ve thought of a new topic for you too… will send off-blog. Thanks Sally for checking out my book Cover and for your brilliant editing. I LOVED Anthony’s idea of connecting the design colours, fonts and graphics on the sequel. 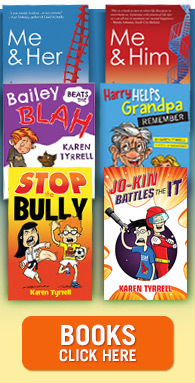 It looks terrific, Karen and I’m sure the book will help vast numbers of people. Congratulations! Wishing you every success. As other people have mentioned, having a similar matching designs works well. Again the cover is full of colour which makes it stand out. As on the original book, I do like the DNA strand. The quote should appeal to many. Thanks Graham, for coming along here to check out the cover in close-up. Thanks for the all the positive feedback. Thanks Heather, That’s very kind of you to be excited over my book cover.